Based 100 yards away from Madame Tussauds in central London, the Royal Academy of Music is certainly in the limelight of the tourists and local community. The Academy is actually situated on the Crown Estate, where any construction is heavily controlled, and an impeccable appearance is key. With restricted space available, and following long discussions with the estate, it was agreed that we could set up our site cabins on a gantry overlooking the road. As a consequence, we have spent a considerable effort to blend into the community. We began by painting all of our hoardings and external fixtures ‘Regents Park Cream’ which is the same colour as all of the buildings on the estate. The hoarding is often repainted to match the high quality finish that is the norm in the area. Another request from the estate was to minimise our corporate advertising. We located our signs in discreet positions where it did not offend the public eye. An example of this is behind the site entrance door, making it only visible during working hours when the offices are open. In order to take deliveries into site, we have a partial road closure (8:00-17:00) every day. Out of these hours the road is opened again to allow free movement of traffic into the residential area behind the Academy. This created a challenge to set up a high quality, safe delivery area each day. 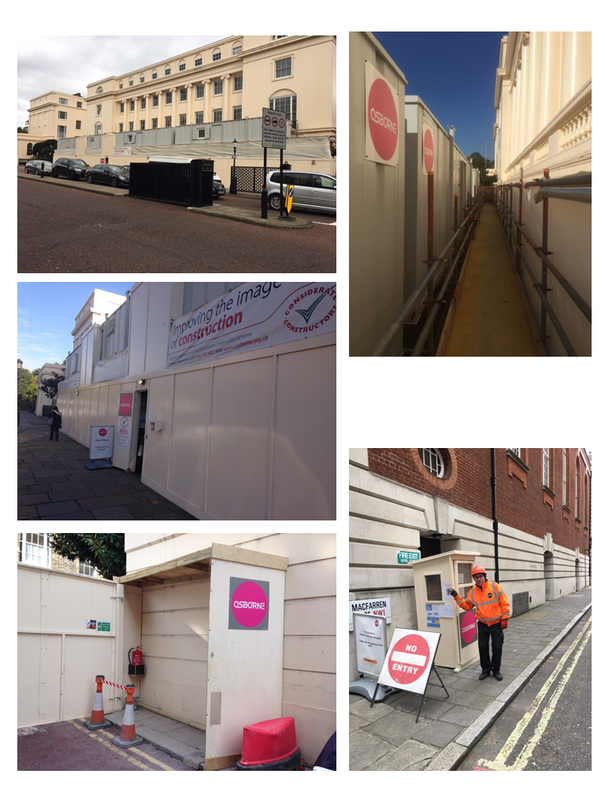 In order to make this a quick and easy process in the mornings and evenings, we built a foldable smoking shelter and a portable Traffic Marshall hut, both painted in the Crown Estate colours. Our traffic marshal is a friendly face to approach if members of the public have any questions to raise.